One of the biggest factors in making a small business a breakout success is building a tough team that’s capable of handling any obstacle. Growing a strong team, however, is often easier said than done. You know what’s needed, and you have your objectives in sight. Now, the question remains – how do you go about meeting those goals and getting all the members of your group on board? Assembling an effective team requires a top to bottom approach. To start with, you must choose the right people for your small business and account for the continual improvement of that unit. Somewhere in the middle of this process are team building exercises. Precious few leaders know how to successfully implement them into their team building strategy, yet we all have heard of them. It’s a good idea to ditch the awkward, forced exercises in favor of a strategy that allows your team members to grow organically as a unit. One core aspect to remember as you establish your team is that a strong one requires commitment – from you as well as from your employees. Be sure to assess your employees from the beginning to determine their needs and desires, and to ensure that everybody is on board. Consider these tactics to help build a stronger, more effective team that will work together as a unit to handle any obstacles that come their way. Teams that spend time with one another naturally tend to come together as a group. However, don’t count on all those hours spent in the trenches as being enough to get them in sync as a cohesive whole. Finding ways to foster “togetherness” is an important step in helping your team to work better together and achieve improved results. A simple way to encourage esprit de corps is to schedule time for group interactions outside of the office. This can be a great way to help your employees form bonds with one another and foster stronger relationships, even if it is merely coordinated break times or mealtimes. You can further extend this strategy beyond normal business hours by planning picnics, barbecues, or parties. Doing so allows your team members occasions to socialize and talk about something other than the next big business venture. When you’re looking to find the perfect way to help your employees become a team, start with understanding their interests. Be sure to keep these opportunities inclusive. ­­Full-time employees, part-time employees, and contract employees alike should all have the chance to take part in corporate functions, whatever they may be. These gatherings are especially beneficial when you’ve recently brought new team members on board, as they are a quick and effective way for people get to know each other outside of the high-pressure environment of the workplace. The type of unifying activities available can vary greatly depending on a number of factors. Some businesses have taken their employees for group outings to wineries, sporting events, and even on retreats. Those looking for more cost-effective options, however, shouldn’t discount the power of a simple luncheon event for encouraging employees get to know one another and to support their development as a team. Perhaps the biggest benefit of promoting togetherness in the workplace is the fact that it helps to build a corporate culture. Always be on the lookout for possibilities that align with your business’s personal goals. For example, hosting an event that caters to employees and their loved ones is a great option if one of your key tenets as a business is championing family time for employees. In the office, groups function best when there is an understood common goal and steps are being taken to work toward it. Help your team members acquire this by getting them involved in the community in some capacity. Let them volunteer together, plan a fundraiser, or form a crew for a community program. You might even consider sponsoring a particular charity for an entire year so that everyone in the company has an opportunity to contribute in some way, whether by donations of money, time, talent, or something else. Getting involved in the community has many positives, above and beyond team building. As a business, it means that you are investing in the locale where you do business. It shows that you and your employees value the area and its people which, in turn, leads to more business. An added bonus is that your employees learn more about where they work and live. Most people enjoy giving back, and this type of work gives your staff members a common goal of benevolence. The feel-good atmosphere that exists can help ease stressed mindsets while providing a laid-back environment in which the value of learning to work together is achieved – all positives that translate back into the workplace. 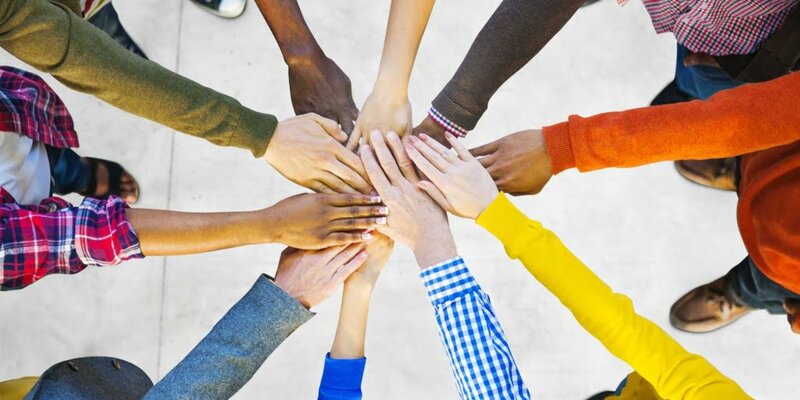 If you’ve decided that engaging with the community is the right team building method for your business, then rest assured that there are many opportunities for you to get involved. Charitable organizations, such as the Ronald McDonald House, regularly work with businesses and groups of up to 20 people to complete many different types of tasks. These may include preparing healthy meals for children and their families, performing necessary neighborhood cleanups, or even completing organizational tasks like accounting or marketing as needed. The latter can be an especially beneficial option for small businesses, as it allows workers to put their skills to the test in an environment where they feel encouraged to problem-solve and simply get along with others in order to reach a specified target. There are many types of compassionate team building exercises available for small businesses. A popular one developed by team building organizations in partnership with charitable organizations allows employees work together as a group to complete a set goal, such as building a bicycle or assembling “back to school” packs for underprivileged children. Habitat for Humanity is a national organization that regularly works with larger groups, but there are certainly local clubs in your area that offer similar outreaches. Do your research and you’re sure to find a great option that aligns with your employees’ interests, your company’s goals, and your organizational specializations. Whether it’s hiking, biking, or any other form of conditioning, there are numerous advantages to encouraging your employees to get physical. When your team members work together as a group to complete a hands-on task, they’re also building skills like cooperation, perseverance, and more than translate directly into the workplace. There are some things to keep in mind when planning applied activities for your workers, however. Remember that not all people are not at the same level of health, and that the whole point is to be inclusive. If this is a good option for your team, be prepared to make accommodations as needed for different stages of capabilities. Employee wellness programs have numerous advantages, one of the biggest being that they help to align the personal goals and well-beings of employees with that of their team and the organization as a whole. One such example of a course is a walking group. Give your people the chance to sign up, and then be sure to schedule walking group meetings at a time convenient for all. Those who have the resources to do so can even schedule fitness classes at local health clubs. This is especially beneficial and popular when combined with a gym membership as a part of an employee benefits package. Encouraging employee wellness is also beneficial for your business, as a healthy worker is a happier and more productive one. Be on the lookout for organizations and programs that specifically cater to the needs of businesses and their employees. Plentiful, they offer an easy and efficient way to set up an inclusive wellness program that all will be sure to enjoy. And, as always, be sure that you understand and respect the wishes and interests of your staff when it comes to choosing activities for their wellbeing. Allowing your employees to train and grow together kills two birds with one stone. In addition to boosting their skill sets and their feelings of company worth, learning opportunities are great team building tools. When colleagues work together to acquire a new skill, they start on the same page. There are many different types of educational endeavors to be had, depending on your industry. Academic trips, conferences, and in-house training are a few universal options. An added benefit is that your employees feel that you are investing in their future, meaning that they matter to you. One of the great benefits of using learning opportunities as a team building tactic is that it provides a wide scope of chances to implement within your business. From the latest and greatest new technologies to age-old industry concepts that can be used to boost productivity, the possibilities of putting them into practice are endless. A little bit of research into your industry often reveals countless occasions for in-house training, industry-related conferences, and much more. However, an even better place to start is with your employees themselves when considering the curiosity they have for various types of break-out development instances that exist. Talk with your employees. Find out where they feel their skills and abilities could be strengthened, or areas where they feel that your organization could stand to grow as a whole. A great advantage of having programs geared specifically to meet worker needs is that it helps to improve morale and dedication in the workplace. Sending your workers to conferences is a widely used way to enhance collaboration in an environment that encourages cooperation while having a natural focus on team-building. It also gives an opportunity to discover and embrace new tactics obtained from other teams that can be brought into the workplace. Regardless of the type of team building tactics that you choose to implement, keep a few things in mind to boost the efficacy of these exercises. Have a Set Goal – Employees want to feel as if they are doing something of value with their time. Throwing them into team building exercises without explaining the purpose of the exercise is the easiest way to get people to mentally check out. Setting goals and having checkpoints for meeting them can go a long way toward ensuring these activities are successful. Some examples of set goals may include communication building, working on specific problems that have arisen in the workplace, or simply improving the amount of time it takes to complete specific tasks. Learning opportunities for employees are an especially effective way of introducing and implementing tasks designed to meet specific objectives. Choose Activities Based on Goals – If you’re simply looking to foster employee relationships, a simple potluck or barbecue can be an ideal team building solution. However, be sure that you are choosing exercises that will allow your team members to work on these goals if you’re looking to improve communication. More importantly, openness and honesty about the purpose of the exercise is essential. Many of the aforementioned charitable activities are great opportunities for this kind of communication building, as they require employees to work together on a single activity in a set amount of time to accomplish a goal. Embrace (Healthy) Competition – A little bit of competition goes a long way toward building an effective team. However, too much rivalry can have an adverse effect. Take the time to find a happy medium when it comes to incorporating this tool into team building exercises. Encouraging teamwork by creating smaller groups and fostering healthy contests between them is a great starting point, and can be especially beneficial when you’re looking to increase cooperation between different departments within your organization. The concept of team building tactics can feel cliché. Everybody has been in attendance of uninformative Q&A sessions where it feels as if everybody – the person leading the Q&A included – has left the building. But taking a proactive approach and seeking out appropriate team building exercises that align with your organization’s core goals can help you construct the type of team that breaks down barriers and gets things done.